Leather furniture has come a long way since our ancient ancestors sat on animal skins to provide a cushion from the hard ground in their caves, but one thing hasn’t changed. People have always loved sitting on natural skins because they are super comfortable. Today, high quality leather furniture is comfy, classy, timeless, luxurious, and distinguished looking. It is also surprisingly durable, as long as you know how to clean and care for it properly. Finished leathers are more durable, stain-resistant, and uniform in appearance than unprotected leathers. Luckily, common products found around the home are typically all you need to keep finished leather furniture looking beautiful for many years to come. 1. Vacuum (with brush attachment): Eliminate dust and loose debris using a brush attachment on your vacuum. 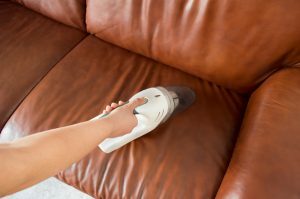 If the piece has loose cushions, don’t forget to remove them and vacuum underneath. 2. Clean cotton or microfiber cloths: Leave the cushions off if you removed them and put them back into place after you wipe them down with a clean cloth. Now that you have vacuumed and wiped down the surfaces, you may have spotted a few areas that need additional TLC. 3. Vinegar, water, small bucket: Mix equal parts of common white vinegar and water in a small bucket. Dip a corner of a clean cloth in the liquid, wring out the cloth so it’s damp, and wipe down soiled parts of the leather. Test an inconspicuous spot first to ensure the vinegar doesn’t discolor the leather. Make sure you rinse the cloth after every few strokes so you don’t spread dirt around. Be careful not to use a wet cloth because saturating the leather can damage it. When you’re done, dry all the areas you washed with a clean, dry cloth. 4.Mild, non-detergent, neutral PH liquid soap: As an alternative to diluted vinegar, add a few drops of liquid soap to distilled water to create a cleaning solution. Moisten a cotton or microfiber cloth with the solution, wiping from top to bottom. Dampen another cloth with plain distilled water and wipe the furniture again before drying it with a clean cloth. Leather experts warn to stay away from any products containing caustic or abrasive ingredients, ammonia, detergents, furniture oils, or polishes. Commercial leather cleaner for furniture is fine, as long as it is a brand recommended or approved by the furniture maker. 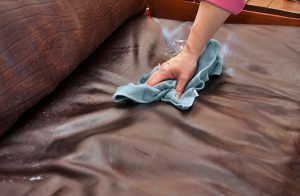 Keep in mind warranties may be null and void if the wrong cleaner or conditioner is used on leather furniture. If the piece of furniture came with specific instructions, be sure to follow them. Do not experiment with stain-removing products because they can make matters worse. If you have unprotected leather furniture (e.g. nubuck or suede), you can vacuum it and wipe it with a dry cloth, but it is best to consult a professional if it is stained or soiled. 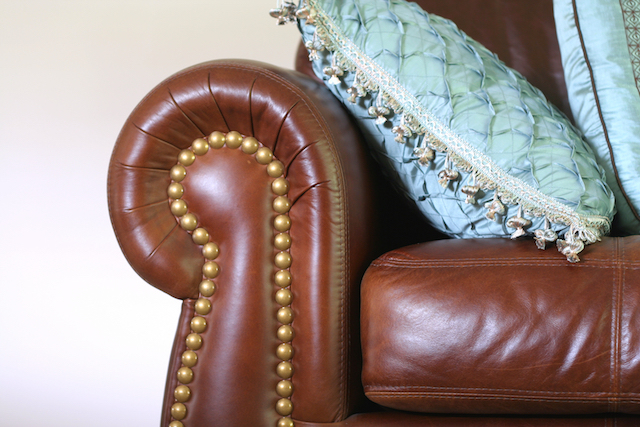 Like fine wine, high-quality leather furniture can improve with age, as long as you give it a little TLC!